Cherrystone Auctions, an industry leader in auctions of stamps and stamp-related materials based in New York, has published to its website the list of prices realized at its most recent auction. The live auction was held on November 29th and November 20th of 2016 and focused on U.S. and worldwide stamps and postal history. Approximately a thousand lots were sold over the course of the auction. Among the highest prices realized were a lot of United States pictorials from 1869. It sold for $14,500 and was listed at a catalog value of $24,400. 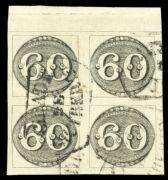 The lot that sold for $14,500 was a complete set of 78 stamps. Each stamp had large margins and fresh colors, which are considered by the stamp collecting community to be crucial determining factors to a stamp’s overall condition. Another contributing factor to the lot’s high value is the rarity of the set being kept completely intact. The lot description, available on the website of Cherrystone Auctions , indicates that very few of these U.S. 1869 pictorial sets have been kept together. The late November Cherrystone Auction realized high prices on stamps from all over the world, the published results indicate. A stamp from Brazil, printed in 1843, realized a price of $14,000. Its description on Cherrystone’s website notes that the stamp had realized a price of $8,050, nearly a decade ago, in 2008. Other stamps which realized prices of $9,000 at the November auction included stamps from Russia printed in 1934 and another from the United States, this one issued in 1857 and featuring a portrait image of George Washington. In addition to holding regular live auctions, which people are able to participate in remotely via Cherrystone’s interactive online bidding system, the auction house also maintains an online stamp store and an online Gallery of Rarities featuring images and descriptions of some of the world’s rarest and most valuable stamps. Cherrystone brings over $30 million of collectibles to market each year. They have been in existence, centrally located in New York City, since 1967 and have sold some of the rarest and most valuable private stamp collections in history.